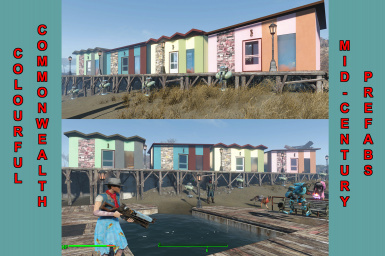 A set of six little Mid-Century Modern/Atomic-style prefab shacks/cabins for more colourful settlements. 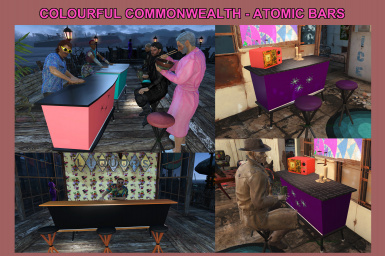 A bright and colourful set of Atomic-style bars, in functional (settlement bars) and decorative (table) versions. 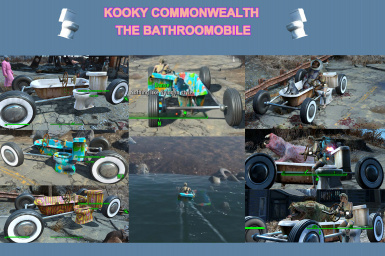 A kooky car just for a giggle. Comes in six colourful and/or silly variations. 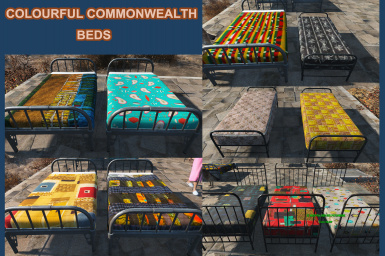 A set of cheery recolours of three default beds and the sleeping bag. 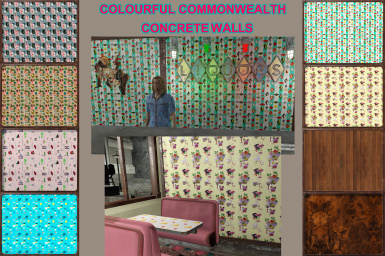 Colourful recolour sets of the concrete walls and concrete staircases. 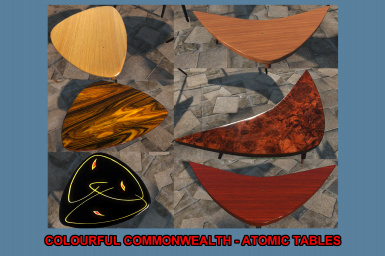 Two new Atomic-style coffee tables and four colourful retextures of the Diamond City radio. 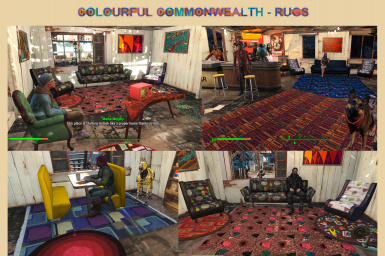 21 very colourful rugs in three different styles, to brighten up your settlements. 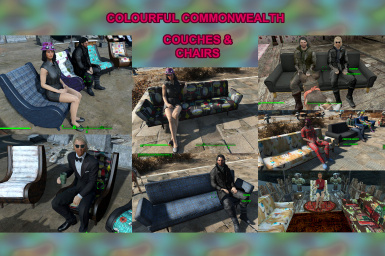 A set of 23 colourful couch and chair recolours of base game furniture. 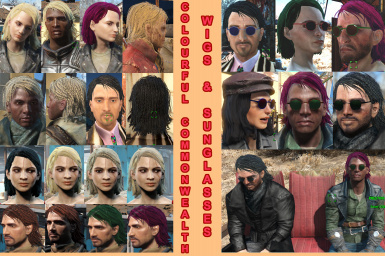 New small round sunglasses and a set of shoulder-length wigs in braided textures and unnatural colours, for male and female. 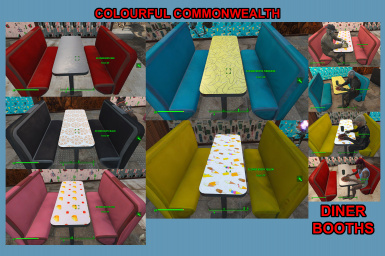 A colourful set of three craftable dining tables: Two recolours (The Diner Booth and the Small Round Dining Table) and a new table, Kidney-Shaped Dining Table. 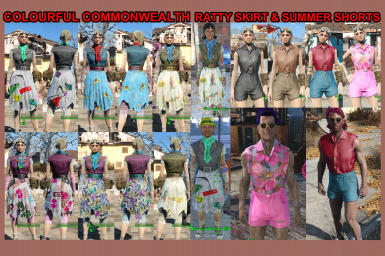 A colourful set of three casual outfit recolours for your more informal player characters, companions and settlers, male and female: T-Shirt & Slacks, Ratty Skirt, and Summer Shorts. 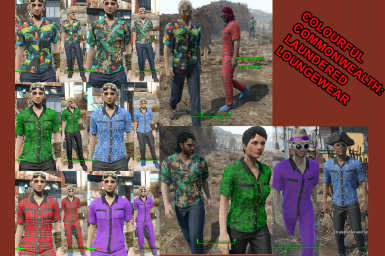 A colourful collection of three sets of leisure wear for yourself, companions and settlers, male and female.